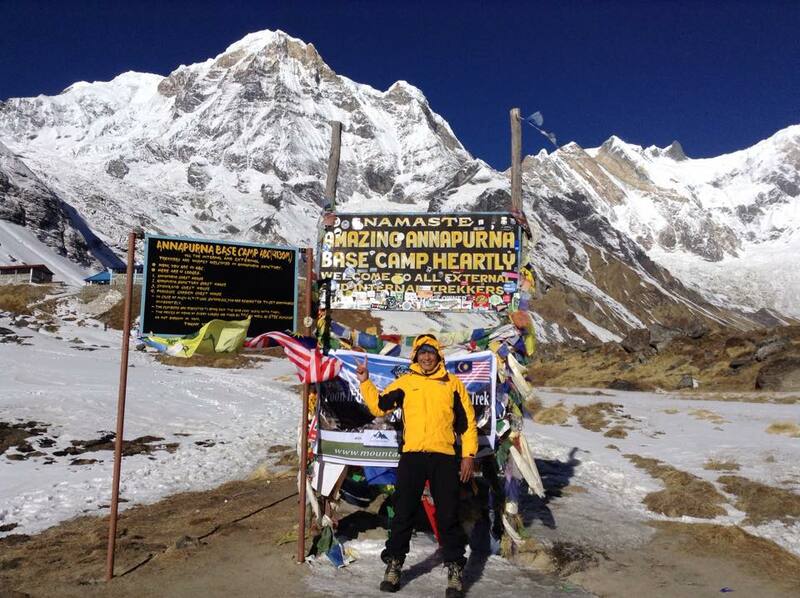 My name is Sanjib Adhikari, ( Nepal Mountain Guide) an independent trekking guide and tour operator. I want to welcome everyone to my beautiful Himalayan country Nepal. Having always been attracted to the great outdoors and adventure I started my career in 1998 as a Porter and assistant trekking guide. 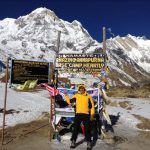 After gaining enough knowledge I became an independent and fully licensed trekking guide in Nepal. Having successfully guided many guests through the rough and high terrains of Nepal I became fully confident to start my own agency and with great success. To me guiding guests is not only a job but a life goal to build knew relations and educate my guests on the cultural and geographical aspects of Nepal. It is with great pleasure that I invite every soul to visit this great Himalayan country and to reach even further heights! A little history: I myself have been over expeditions to Mera peak, Island peak, Kalapathar, Gokyo peak, Tseryo RI and across many high passes in Nepal, Larkye Pass, Ampulapcha Pass, Chola pass, Renjula pass, Tashilapcha pass, Ganjala pass, Thorong La pass, Tilicho pass, (Mesokantola pass). Within the long span of an adventurous journey, I have extensive guiding experience on Mt. Kailash, Lhasa in Tibet also in Bhutan I had joined many expeditions. Doing treks and expeditions for over 20 years I have gained the confidence and experience the guide every guest and be informative in every destination. I have guided many international groups especially from Europe, Asia, USA, Canada and Australia through the Everest, Annapurna, Langtang, Mustang, Dolpo, Kanchanjunga, Makalu, Manaslu, Ganesh Himal and Helambu regions of Nepal. By doing so I had gained a lot of experience and extensive knowledge on geography, religion, culture, local flora and fauna and on environmental issues in the areas where I personally organized the treks. We arrange all the customized packages on the basis of your interests and liking. Together with our highly friendly and experienced staff as well as your prior experience or interest, we can develop a personalized program according to your budget, time and preferences. Trekking is the way of relating to the local community and practicing their life. One can enjoy an accommodation available according to the various regions. Accommodation varies from tea houses in the local way and camping in the restricted and remote regions to home stay with a local Nepali family. For any kind of trekking, we make proper arrangements to provide hygienic foods, a safe and comfortable place to stay concerning the demand of our visitors. My first experience on many trekking routes has made me an expert on making unique trekking itineraries as per the tastes, interests and budget of all my clients. For those international trekkers who want to climb high mountain passes and peaks, I can also organize this challenging and rewarding adventure. We arrange all the necessary logistics necessities which include permit cards, pick up from the airport, national park fee, arrangement of porters and all other necessary requirements. We have been organizing the trek in association with the local communities who are in true sense an ecologically aware. We are environmentally concerned with utilizing local resources which are beneficial for the local economy. As well as we sort out our own garbage and the waste disposal .Thus, making our trip fully environment friendly. Relating to the local ethnic communities and learning their unique way of living is also an important aspect of our trekking. From time to time I keep upgrading my skills and knowledge by taking refresher training on safety, sanitation, first–aid, emergency rescue, hygiene and cooking, safe accommodation. We follow all kinds of safety and precaution method .Though, we assure for making your trip fully secure and safe. We set out the itinerary budget in an economic way with an affordable accommodation and healthy food. My clients have been very pleased with my professional guiding services, and you may read some of their comments on my website. We always strive in giving some more qualitative service indeed. My guiding service is dedicated to helping you enjoy your adventure travelling. Please contact me at the email address listed below or contact me online if you have any questions or would like to discuss a possible trek in Nepal! I look forward in being your travel guide!